A serendipitous Christmas tree: I was buying my kids present from a couple who was moving out of state. They happened to be throwing away their Christmas tree. 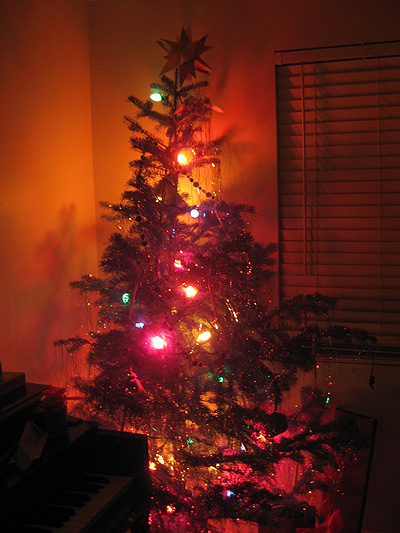 And my landlord gave us a string of lights. The kids had so much fun decorating this! It’s the best Christmas yet. Try as I might to express myself, there really aren’t words for how grateful we are for kind friends, neighbors, and family, and for the many little wonders we’ve experienced this season and all year. If you happen to be one of the many who have gone in with God on the miracles… thank you. My wart I think is gone there is a little dot of what looks like the wart should I do something to get rid of that. Also on my other foot I think a wart is growing:/ I I’m sick of warts how can I get them GONE!? Please help they are very annoying! I would treat them both until they’re gone. Also, make sure you’re keeping your immune system strong with plenty of rest, exercise, water, and good nutrition.